Rob Smith, editor-in-chief of the Puget Sound Business Journal profiles George Harris, president of the Northwest Marine Trade Association. The NMTA produces the Seattle Boat Show, which attracts more than 50,000 visitors from 31 states and six Canadian provinces and as far away as Dubai and Brazil. Dedicated volunteers from Delta Airlines are spending 6 weeks renovating a house in Federal Way for Habitat for Humanity Seattle-King County. It represents some significant milestones for all: the 400th Habitat house in King County, 200th house that Delta volunteers have worked on globally, and the 50th house Habitat has renovated in Federal Way. Read more about this cool project. “This wonderful cookbook is full of rustic and unique recipes. It’s LaDonna’s 3rd cookbook and all of the recipes were made in a diesel oil stove on their commercial salmon fishing boat! Talk about interesting! There are so many recipes I can’t wait to try!” Thanks, Sheena! Read the rest of her review here. Evening Magazine profiles Kubota Garden’s Rock, People, Chisels event and documents a part of Seattle history. See artistry and history come together in the making of the ishigaki wall. La Donna Gundersen’s third cookbook My Tiny Alaskan Oven was written on her boat but is great not just for boaters with small galleys but also for small space cooking of any kind. As the Spokesman Review says, Cookbook makes use of small kitchen, fresh ingredients. It’s hard to believe that there could be anywhere on earth as beautiful as Seattle on a glorious summer’s night. 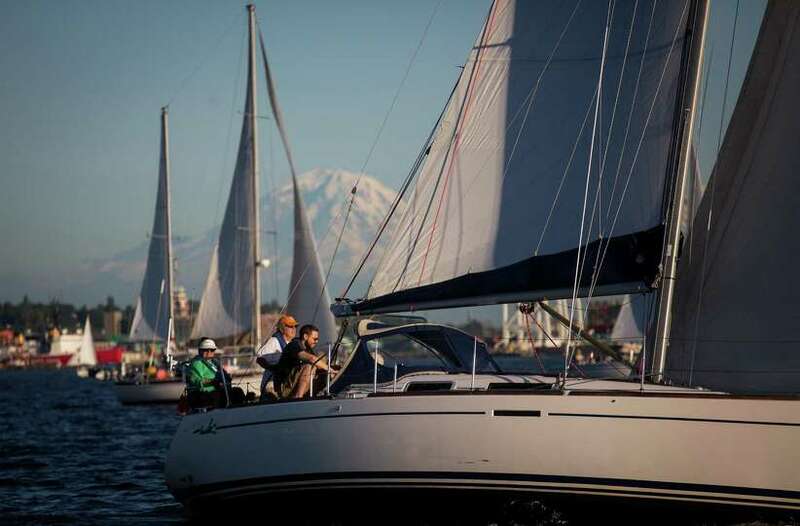 Check out this glorious 30 photo slide show from The Seattle Post-Intelligencer of the Downtown Sailing Series at Elliott Bay Marina. Q13’s Bill Wixey interviews ChemoBite’s founder Kirsten Rogers and her dad, David, and learns about how David’s diagnosis of cancer led to the creation of Chemo Bites – gift boxes of healthy snack options are delivered to patients’ homes or to the hospital so that they can focus on healing. A touching and inspiring story. More than 10,000 women from all walks of life around the country raised hammers, picked up paint brushes and participated in Habitat for Humanity’s 6th annual National Women Build Week. Locally, women volunteers from Women Business Owners, Delta Airlines, the Junior League of Seattle and Lowe’s worked on homes in Snoqualmie Ridge and in Rainier Vista. Read about their work in Snoqualmie Ridge. Another article as a result of the press flotilla we were involved in. This one highlights some of the writers favorite San Juans locales and activities, including fishing, crabbing and whale watching. Read about his San Juan Island Hopping. Seattle Business magazine honored Washington state’s most sustainably oriented organizations at the Green Washington Awards. In addition to identifying a Washington Green 50 list of outstanding organizations, the magazine recognized winners in 12 categories drawn from across the state and from virtually every sector of the economy. Habitat for Humanity Seattle-King County was selected as the winner in the Non-Profit category. This Art of Manliness story is the first of many that Samuelson Communications helped coordinate through Discover Boating to bring national writers to the Pacific Northwest for a press flotilla to talk about the wonderful boating, cruising, fishing and more in our region. More stories will appear in print and online across several publications in the coming year. You can read the story here and we dare you not to drool! At Habitat for Humanity Seattle-King County’s Build-a-Thon more than 120 AmeriCorps members from 11 different states and 27 different Habitat for Humanity affiliates nationwide participated. Q13 morning news anchors Bill Wixey and Kaci Aitchison also lent a helping hand. Although the jury’s still out on how much help they actually were! You be the judge. The Daily Meal features ’15 Salmon Recipes That Won’t Make you Yawn.’ And naturally, LaDonna Gundersen’s is one of them: Soft Spring Rolls With Smoked Salmon and Fresh Basil. Yum! Volunteers are the heart and backbone of Habitat for Humanity. Last year 2,722 dedicated volunteers contributed 57,075 hours to Habitat for Humanity Seattle-King County. Northwest Prime Time profiles one couple who have been volunteering for more than a decade and have helped build more than 80 homes! Read the Mickelsen’s story here. Mild-mannered bus driver by day, amazing aerial acrobat by night! KOMO 4’s Denise Whittatker captures the double life of the amazing Jonathan Rose who wowed showgoers at this year’s Seattle Boat Show as part of Splash, the new nightly aerial show. Ever wonder what it’s like to work on a small fishing boat in Alaska? Read this UK story about a day in the life of commercial fisherwoman and cookbook author LaDonna Rose Gundersen. The Northwest Marine Trade Association recognizes Lisa Samuelson with the Latham Goble award. The award is given to “an individual or organization who has made a significant contribu tion to the marine industry but does not work directly in the industry.’ Previous award winners include Congressman Norm Dicks, Senator Jim Horn, Tod Lieweke (former Seattle Seahawks manager) and the Seattle Yacht Club. Wow! Wow! Read the full Three Sheets NW story here. The Wall Street Journal profiles Lee Gelb, co-founder of Zavida Gemstones, a socially conscious jewelry business. The story was a year in the making but well worth waiting for! Zavida Gemstones was born out of a desire to give back to those less fortunate and a passion for jewelry. The spirit of Zavida is captured in this wonderful profile in the Huffington Post. Be sure to also watch the fabulous slideshow. Lee Gelb and partner Shelley Milano give 25% of the company’s profits back to the areas where the gems they sell have been mined, and where the artisans work. They’ve also established a scholarship for the children of the artists they work with. Lulu del Rosario of Clout & About says: ALL the recipes by LaDonna Gundersen are enticing, mouth watering and easy to put together…The photographs and stories within the book are captivating…The photography for the book is by LaDonna’s husband Ole Gunderson, himself a fisherman with an excellent eye behind the lens! The cookbook is a wonderful testament to their fondness of the ocean, their togetherness, love of cooking and baking and celebrating with friends….My book review? It’s like 52 love stories with dessert on top of every good dish.” Read the full review here. What does Angry Birds have to do with the Seattle Boat Show? Watch Kaci from Q13 an find out! Of Salmon, Desserts & Friends, Cookbook Man says: ” La Donna has put together a fantastic collection of salmon recipes. Not only are they fun and easy to make, but, her and Ole’s story is pretty unique and interesting.” Read the review here. King 5’s Evening Magazine profiles the wonderful Girls on the Run whose mission is to inspire girls to be joyful, healthy and confident using a fun experience-based curriculum which creatively integrates running. Special thanks and kudos to producer Joan Kinsey for so artfully and masterfully capturing the spirit of Girls On The Run. Watch the story here. on TableTalk Radio – Radio That Tastes Good – with hosts Jamie Peha and Chef Thierry Rautureau, “The Chef in the Hat”, a James Beard Award-winning chef and owner of Rover’s and Luc restaurants in Seattle. The Women Business Owners, a Puget Sound’s organization for women entrepreneurs, has named Janelle Bruland of Management Services Northwest of Ferndale as the 2011 Nellie Cashman Woman Business Owner of the Year. Five amazing, inspiring women are finalists for this year’s Nellie Cashman Woman Business Owner of the Year Award. Read about one of them – Jessica Bishop of StudentPainters.net – in the Ballard News Tribune. The winner will be announced at a gala at The Fairmont on Oct 13. Good luck ladies! Each year, Washington State sport fishers catch more than a million pounds of Dungeness crab! The recreational crab fishing season got under way July 1 and includes an extra day per week this year. The Washington Fish and Wildlife Commission wants crabbers to ‘know before you go’ so they understand the rules and can fully enjoy the season. King 5’s Christie Johnson helped spread the word and learned how to tell males from females and how to measure for keepers. Click here to watch crabby Christie! Expert crabber Neal Booth shows King 5’s features reporter Christie Johnson and photog Jim Scott the finer points of crabbing. Recreational boating was on the front page of The Seattle Times, above the fold. In fact the story was most of the page. 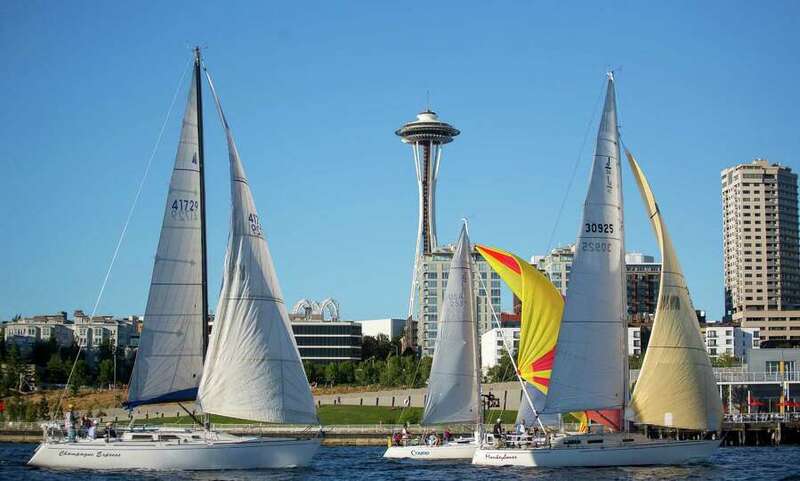 Deborah Bach from Three Sheets Northwest wrote a terrific feature story about the Downtown Sailing Series. The story was accompanied by gorgeous photos from Times photog John Lok. Be sure to check out the online photo gallery in addition to reading the article. Peter Schrappen, Director of Government Relations for the Northwest Marine Trade Assocation, discusses boating safety and boater education with Christie Johnson from KING 5 TV. Christie Johnson takes to the water to promote the inaugural NW Paddling Festival at Jack Block Park in West Seattle. Watch the video and check out her paddling skills. Kaci from Q13 tries her hand at stand up paddleboarding and kayaking as part of the NW Paddling Festival. Watch Kaci learn to paddle board and kayak. Karolina Longoria and Elayne Wylie-Weichers from Seattle Out & Proud (SO&P) discuss the Pride Picnic on KCPQ 13 Fox with morning anchors Lily Jang and Bill Wixey. Ballard’s Quixote Foundation announces its decision to spend its entire endowment in order to have the greatest impact as a foundation. Coverage of their spending up announcement ran the gamut from The Ballard News Tribune to The New York Times. Read the New York Times article.